The Florida Gators take the field during the first half as the Florida Gators defeat the LSU Tigers 27-19 at Ben Hill Griffin Stadium in Gainesville, Florida. October 6th, 2018. Gator Country photo by David Bowie. A cupcake is a delicious indulgence. It’s also, in the college football universe, a very expensive treat. In terms of scheduling every team that belongs to a conference would play a requisite number of conference games. 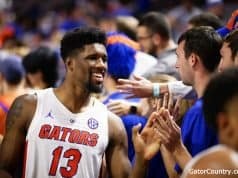 In the case of the Florida Gators that is eight games against SEC opponents, leaving four open dates to be filled with other teams. Most schools, Florida included, choose to fill those open weeks with non-conference, non-Power 5 schools. For instance, last season the Gators out of conference schedule included Charleston Southern, Colorado State, Idaho and its annual game with Florida State. The first three games are tough, tough tickets to sell and it showed. However Florida has always argued that it plays in the SEC, which is already very difficult to navigate. It also has an annual neutral site game with Georgia in Jacksonville. That means every other year the Gators only play six true home games and that’s he bare minimum that the University Athletic Association wants to have. 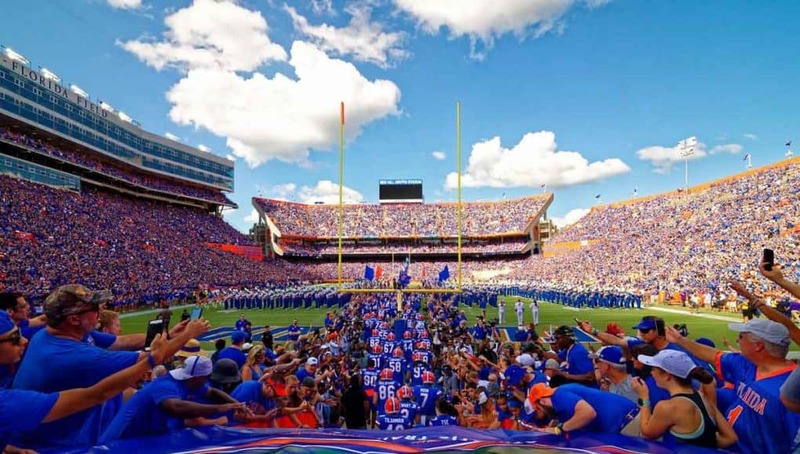 They argue that it’s for revenue, not just for the university but also for the city of Gainesville, which rakes in millions of dollars on any given game weekend. When Dan Mullen was asked about that thought, and specifically asked about a potential home and home with Oklahoma, he didn’t seem thrilled with the prospect. The Gators are not alone, last year Arkansas didn’t have a single Power 5 team on its out of conference schedule. Georgia, like Florida, only had instate rival Georgia Tech as an ooc power 5 opponent and the same with Kentucky (Louisville). Tuesday Georgia announced it would be adding Clemson and Florida State to future schedules. Five months prior Georgia announced a future schedule that included Texas, so it’s clear that Kirby Smart isn’t afraid of taking on a tougher schedule. Georgia is in the same boat as Florida when it comes to having that one pesky neutral site game every year. That isn’t stopping the Bulldogs from creating more difficult schedules, so the question that begs asking is, should it stop Florida? 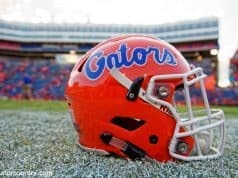 It may be true that even with schedule three non-P5 teams that the Gators’ schedule is difficult enough. If the Florida Gators win their games on Saturday they’re going to make the College Football Playoff. There’s no universe where an undefeated SEC Champion doesn’t make it to the playoff. So if that statement holds true, why schedule more difficult games? One reason is for the fans. It costs a lot of money to go to college football games, especially when you include potential airfare, travel, lodging and food/drink. Most people will go ahead and shell that out when Florida is playing LSU or Florida State at home, but Colorado State or Idaho? No thanks. Nick Saban used his platform at 2018 SEC Media Days to suggest that Power 5 teams should only play themselves. At the end of the day the head coach and athletic director will work together on future schedules. 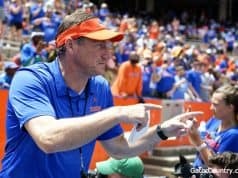 Right now it doesn’t seem that they’re on the same page when it comes to scheduling but Mullen has embraced the Gators’ game against Miami to open the 2019 season and he would likely embrace the opportunity to go and play at Oklahoma Memorial Stadium or the Big House in Ann Arbor or the Coliseum in Los Angeles. From the outside those games in some of the most hollowed grounds of college football seem a lot more appetizing than a Furman flavored cupcake on a hot day in Gainesville.